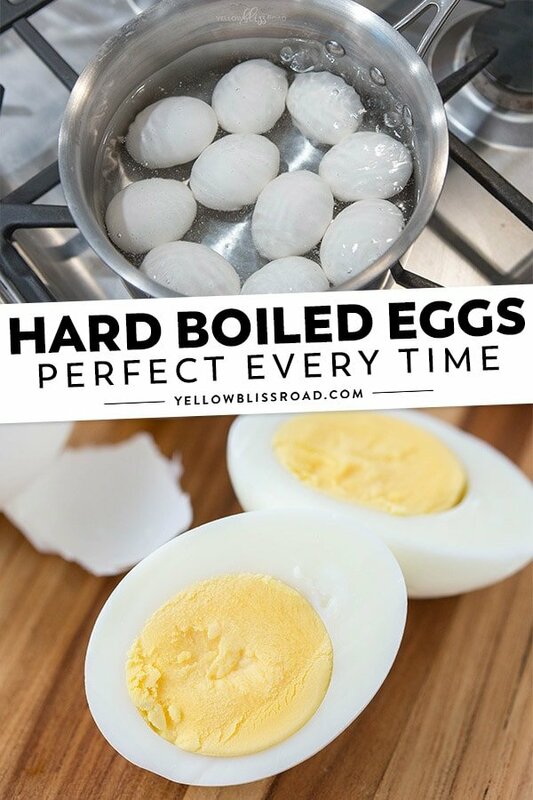 Hard Boiled Eggs – Perfect Eggs Every Time! 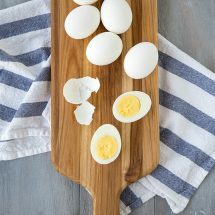 Learn how to make hard boiled eggs the easy way in just a few simple steps. 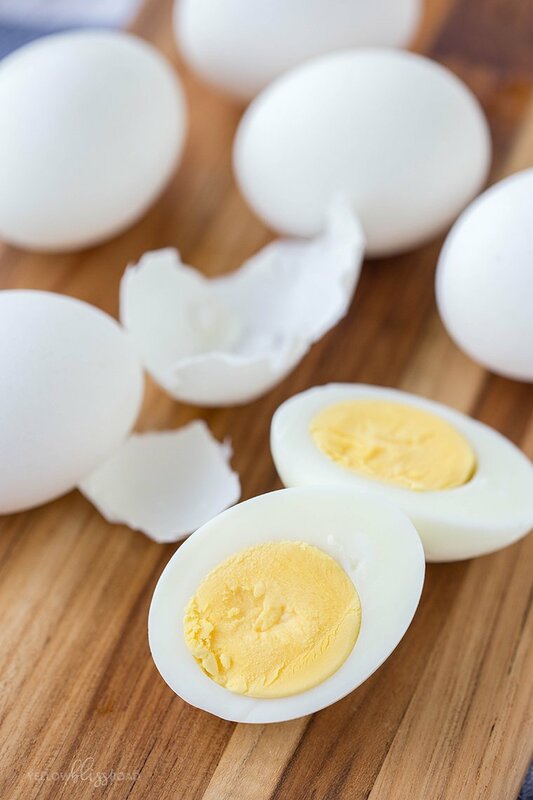 Get those perfectly firm whites and creamy yellow centers every time you boil eggs! I learned how to make hard boiled eggs when I was about sixteen. I have used this method for over twenty years, in recipes like my moms’s Best Ever Classic Macaroni Salad, and of course for making the best Egg Salad, and it has never failed me. Not once! I’ve seen several different methods that cooks swear by, but this is the one that has always worked for me. When I was fifteen, I was entrusted with the job of making and coloring hard boiled eggs for my nieces and nephews to hunt on Easter morning. It was a pretty high honor as far as I was concerned and I was determined to make the best hard boiled eggs ever. On Easter morning, I had my beautiful eggs all hidden and the kids loved finding them. Until one dropped on the ground and splattered half cooked egg all over the patio. Apparently I didn’t know how to boil eggs after all. So the next year I knew I’d better step up my game. I was home from school on spring break and happened to catch the end of the 11 am news and Mr. Food was on. To be fair, I wasn’t trying to watch the news, I just didn’t want to miss the beginning of my favorite soap. Anyway, Mr. Food had the perfect method for boiling eggs – YES! It was just what I needed. I began using his method and I had perfect eggs – every time! Except for the times when I forget to set the timer and end up boiling them for half an hour…but that’s another story for another time. Anyway, I wanted to share my perfect hard boiled eggs method with you today! First, grab a 3 quart pot (or smaller is you are boiling fewer eggs). Gently add a dozen eggs to the pot in a single layer and cover completely with cold water. You want the water to be about an inch higher than the eggs. Bring the eggs to a boil, uncovered, over medium-high heat. Shut off the burner, cover the pot and set the timer for 12 minutes. When that timer goes off, you have to move quickly. Gently remove the eggs from the pot with a slotted spoon. Transfer the eggs immediately into a bowl filled with ice water (you’ll want to have this set up in advance). Leave the eggs in the ice water for several minutes to stop the cooking process. After about a minute, drain the water and store the eggs in the refrigerator. Store hard boiled eggs in a sealed container in the refrigerator for up to 5 days. Gently tap the blunt end of the egg to crack, then peel away the shell. That’s all there is to it! Perfect eggs, with a nice creamy, bright yellow center. HOW LONG DOES IT TAKE TO HARD BOIL AN EGG? 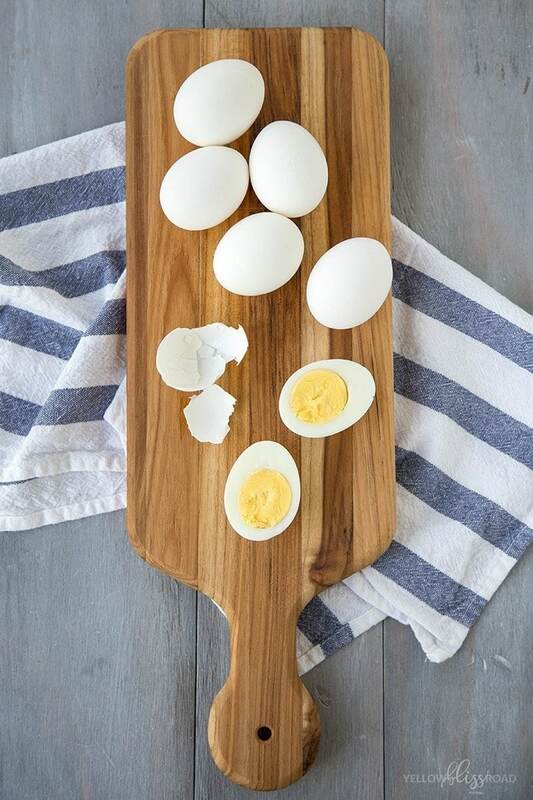 Depending on how you prefer your eggs, you may want them to sit in the water a little more or a little less, anywhere from 8-14 minutes you should still get great hard boiled eggs. If you prefer the centers to be a little softer (I actually prefer mine pretty firm), remove the eggs from the water at 8-10 minutes. You may need to do a few test runs to find the timing that works best for you. The timing also may differ based on the size of your pan, the heat from your burner, the size of the eggs and how many you boil at a time. Find a time and pot that works for you and stick with it. Add a tablespoon of salt to the water as it boils. Add a couple of teaspoons of vinegar to the water. Peel them under cold, running water. Use a spoon to gently lift the peel from the egg. Start with boiling water, add the eggs, and boil for the entire 12 minutes, then straight to the ice bath. This method does work, but it’s not my favorite because I tend to have eggs break when I drop them into the boiling water. Place 8-12 eggs in a 3-quart pot. For more eggs, use a larger pot. The eggs should lay in a single layer. Add enough cold water to cover the eggs. Water should rise to about an inch over the eggs. Turn heat to medium-high and bring water to boil, uncovered. Immediately turn off heat, cover and move the pot from the heat. Set a timer for 12 minutes. Meanwhile, place a good amount of ice in a large bowl and fill with water. 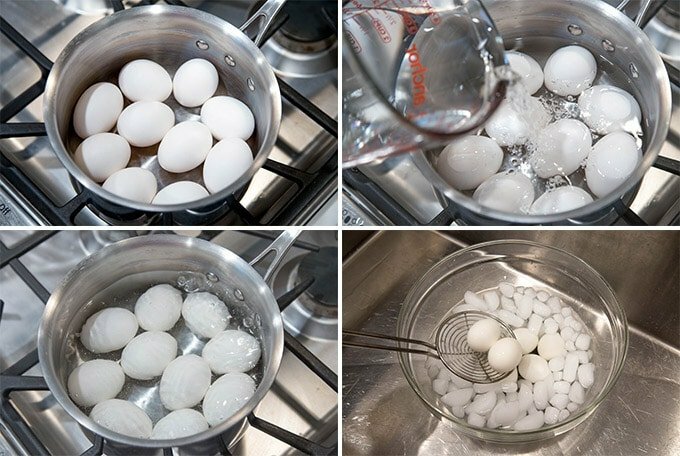 When the timer goes off, immediately remove eggs from the water with a slotted spoon and transfer them to the ice bath. Let them sit for several minutes in the water. Peel and eat immediately (they will be slightly warm), or cool completely in the refrigerator. Store cooked eggs in a sealed container in the refrigerator for up to 5 days. Yup, always been a Southern Cali girl!